The Scizer is a non-invasive body contouring procedure. 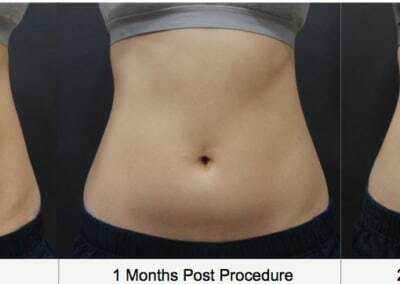 It helps to eliminate stubborn fat deposits around your waist and other areas of the body without surgery. This is possible using MFU technology (Macro Focused Ultrasound). Scizer treatment melts and destroys fat cells below the skin in the subcutaneous layer. As the fat cell count in these localised fat deposits is reduced, your body’s contours are visibly improved. Maximum results are seen 3 months post treatment. Q. What does the Scizer treatment feel like? A. Sensations experienced by patients from different forms of MFU treatment tend to vary, however with the contact cooling technology of the Scizer, any discomfort is substantially reduced due to the numbing effect the hand-piece provides on the treatment area. A. Treatments can take as little as 20 minutes. Treatment lengths may vary based on the size of the treatment area and patient comfort. Q. Who is a suitable candidate for Scizer treatment? A. The Scizer treatment is recommended for all candidates who have stubborn fat in their abdominal region, and are looking for other methods of treatment other than undergoing surgery, which requires anaesthesia and incisions. As long as you have a fat layer of more than 1 inch or 2.5 cm, you are suitable to receive Scizer treatment. Implants and other medical conditions may be an issue. Your consultant will advise you at your assessment. A. Scizer applies ultrasound energy 9mm and 13mm under the surface of the skin, melting the fat deposits in the subcutaneous fat layer at heat levels of 65°C. Temporary redness, mild bruising, minimal discomfort and swelling may occur. All of these symptoms are resolved within 1-2 days of receiving treatment.